In the UK, the 18th century Georgians are seen as the founders of modern society. They invented comfy houses, reading for pleasure, shopping, fashion and newspapers. Still very much as we know these concepts today. They were a rowdy bunch too, according to our sensitive 21st century tastes. The British Library has an exhibition devoted to them at the moment: http://www.bl.uk, to get a flavour of what it was like in those days. The walls of the Highgate project have been painted and the new floor is in. It needs Georgian inspired wallpaper to tie the 20th century furniture in with its surroundings. The exhibition's poster, as life size drawings on the wall? Maybe a bit too loud? Anyway, the exhibition inspired to look for paper to put on the double doors to the guest room and in a niche where the master bed will be. What about this one? A bit too bland? Elegant though: www.cole-and-son.com, but no match for the 1960s sofa (just visible in the photo above). 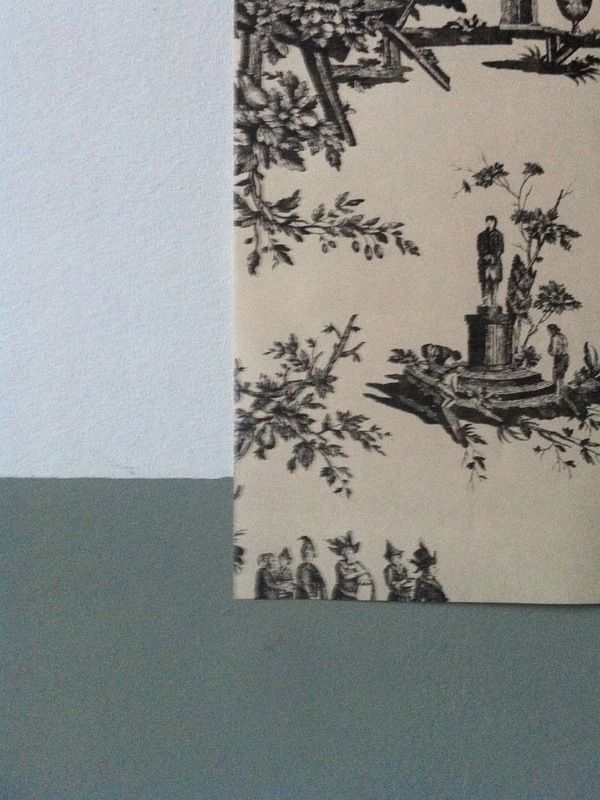 Fuzzy photo but great wallpaper and goes well with the faux panelling on the walls: a Toile de Jouy Chinoiserie-style paper. Very 18th century and a good contrast: www.zoffany.com. And these were the runners-up: more fifties style. Both from www.romo.com. Blinds or curtains may take inspiration from the ochre print. For more on this project, go to www.rutgerhopster.com and scroll down to 17 December 2013.